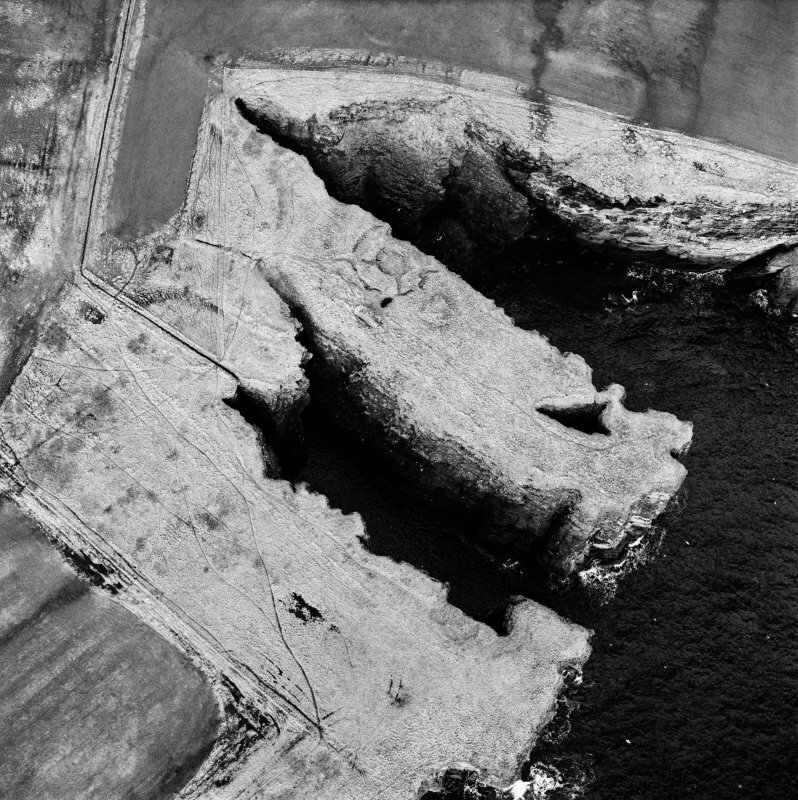 Oblique aerial view centred on the remains of the broch, taken from the N.
Oblique aerial view centred on the remains of the broch, taken from the SE. Oblique aerial view centred on the remains of Skirza broch, taken from the SE. 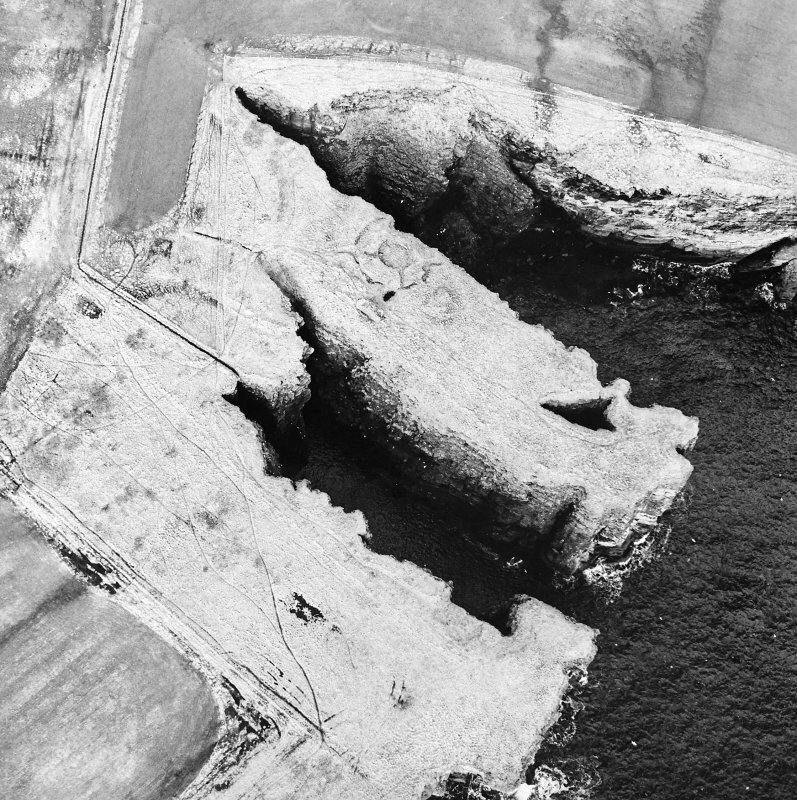 Oblique aerial view centred on the remains of the broch, taken from the NE. The remains of a 2nd to 3rd century broch, situated on the neck of a promontory and isolated on the landward side by a ditch 30ft wide. 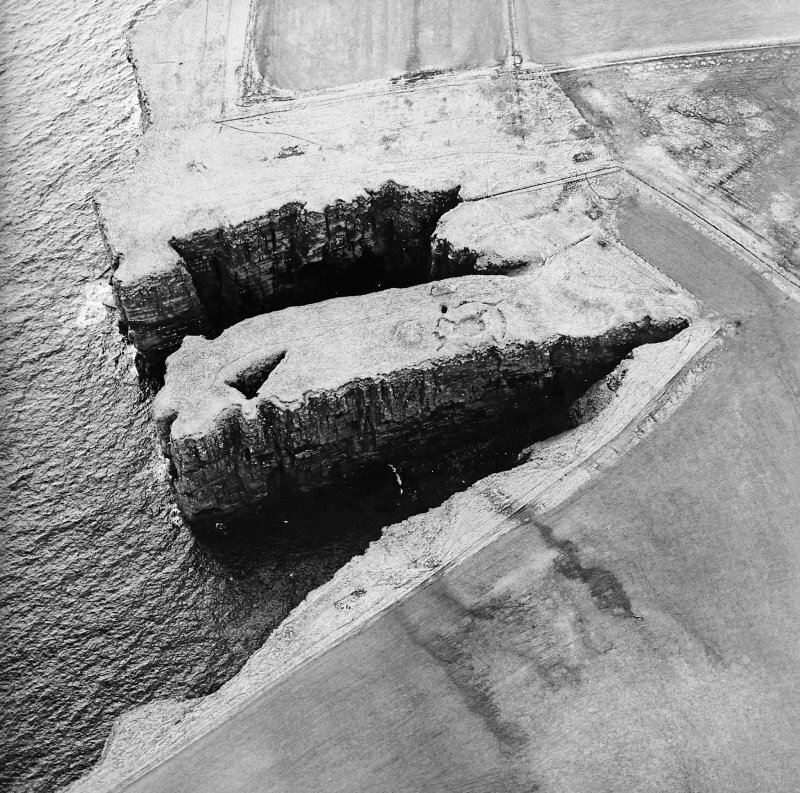 Secondary structures lie N and S as well as inside the broch, which was excavated by Sir Francis Tress Barry between 1890 and 1901 and by MacKie in 1972. It has measured 22ft in diameter within a wall 14ft thick with the checked entrance in the SSE, facing seaward. A scarcement runs round the N arc of the interior, and the exterior of the same arc has fallen over the cliff, together with part of the settlement. In 1910 the exterior wall-face stood 2ft high, the inner 5ft high, and in the S arc of the interior, 16ft W of the main entrance, was a stair entrance although only two steps of the stair and part of the chamber at its foot remained. Three tank-like structures, one of them filled with ashes, and the other two covered with slabs, were set into the floor of the central court. J Anderson 1901; Proc Soc Antiq Scot 1908; RCAHMS 1911, visited 1910; R W Feachem 1963; A Young 1964; E W MacKie 1972; E W MacKie 1974. The broch is generally as described. The tanks in the central court are now uncovered and contain water. The 'well-like' chamber S of the entrance is partially faced with stone slabs and is possibly the remains of a souterrain which seems to have been entered from the W by a passage which has fallen in. There is no water in it now. No surveyable remains of the outbuildings could be found. A modern wall has been built near the cliff edge SE of the broch. Visited by OS (R D) 9 September 1965. The broch and secondary structures are as described by the previous authorities. The interior details of the broch are obscured by thick grass. Whether the cavity to the S of the entrance is a sump or the end of a souterrain cannot be satisfactorily determined from ground inspection. It is similar to the underground chambers associated with the broch at Oust (ND06NE 7). A mound to the E of the broch is probably excavation debris as is the 'modern wall' noted by the previous field investigation. Visited by OS (J B) 10 May 1982. ND 3 6 (area) As part of a wider study of Iron Age Caithness, the broch settlements at Everley (ND 3699 6828), Keiss Harbour (ND 3531 6108), Keiss Road (ND 3488 6151), Whitegate (ND 3541 6120), Skirza (ND 3940 6844), and Hillhead (ND 3762 5140) were recorded by total station survey in June 2000. Aspects of the artefactual assemblage uncovered during 19th-century excavations by Laing and Tress Barry were also studied. Probable solid-based broch in Canis-bay, Caithness, standing on the neck of a high cliff promontory about 3 miles south of the north-east tip of Scotland, Duncansby Head. It is the northernmost of the string of brochs along the most northerly part of the east coast of Caithness and was excavated by Sir F Tress Barry in the 1890s. This work was described by Joseph Anderson . No plan made at the time of the excavation was published and only a few signs of out-buildings were detected. The broch was defended on the landward side by a ditch 9.1m (30ft) wide. Swanson made a plan of the entire site in 1984 which shows that a good part of the northern arc of the building has now fallen over the cliff . A limited amount of re-clearance of the interior wallface was undertaken by the author in 1972, mainly for the purpose of making an exact plan . Skirza Head may be a rare example of a badly excavated broch which nevertheless proved to have an earlier stone structure preserved beneath it. The entrance is on the seaward side, facing south-east, and is 4.27m (14ft) in length, 91cm (3ft) wide at the outer end with door-checks 2.44m (8ft) in; thereafter the passage is 1.22m (4ft) wide, narrowing to 90cm again at the inner end . Although checks for a door were apparently seen in 1910  little is visible now. Swanson saw a 'slight rebate' in the left wall, 1.3m from the inner end, but nothing on the right side . A doorway to the mural stair is apparent at 9 o'clock, 4.88 m, (16ft) to the left of the entrance, and a small stair-foot guard cell opened from it to the left: two steps of the intra-mural stair were visible when the excavation took place but had vanished by 1910 . None of this can be seen now except the sides of the doorway or passage. Anderson describes a tank-like feature here which might be interpreted as the remains of a second entrance at the foot of the stair . The inner face of the broch stood up to 1.52m (5ft) high for a short distance at the time of excavation but was mostly broken down well below this. A "scarcement" – in the old meaning of a secondary wall – is described as running round part of the interior from about 12-5 o'clock. This varied considerably in width, from a maximum of 83cm (2ft 9in) at 12 o'clock  to about 20cm just to the right of the entrance. A large rectangular fire-place was found, still with ashes on it, not in the centre as claimed  but just in front of the entrance passage; it may be a secondary feature. There was also a floor tank, not visible in the photograph. A contemporary photograph shows the interior cleared and at first sight the “scarcement” seems to be a very low secondary wall, as one might expect. The front edge of this was re-exposed and planned in 1972 , before the author had seen the Tress Barry photograph. The latter shows these walls to have been extremely low at the time of discovery – like a low platform or bench – and there is a clear indication that the wider part projects from under the broch wall rather than having been built against it. 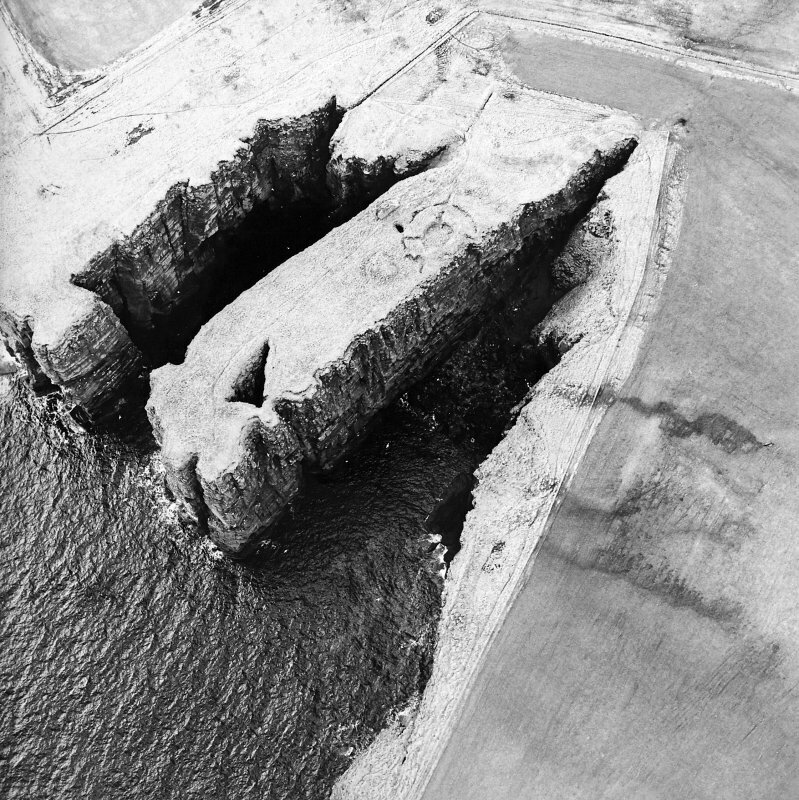 In 1972 the author was able to trace the front edge of this right round almost to the entrance (where it is much thinner) and it appeared then to be continuous with the primary broch wallface just behind it. The photograph however suggests that the masonry may be a little more complex. The impression that at least part of this feature is older than the broch wall seems clear. Outside the entrance and to the south of it was a chamber or well, now visible as a large hole. The forework defence consists of a 9.0m (30ft) wide ditch across the neck of the promontory and the broch is close behind this. The entire promontory is about 70m long by 30m wide, providing a large defended enclosure. Metal objects include a lump of slag (presumably iron). Bone tools found include a small rectangular perforated plate, 1 needle, 1 broken spoon with 3 grooves incised on its back (almost as if it was about to be made into a long-handled comb, except that it looks too flimsy), 1 broken fish-tailed long-handled comb, lacking the teeth, and 4 awls or borers. Stone objects included 1 sandstone lamp (133mm by 108mm by 50mm high), 1 sandstone whorl, 2 whetstones, 1 carefully smoothed sandstone disc 86mm in diam. and a small, thick sandstone disc. Anderson mentions in addition door pivot stones, 2 rough vessels of undressed boulders, 2 quern stones (presumably rotary) and hammerstones, but these do not seem to have reached the National Museum. A contemporary photograph of some of the stone finds shows all these items including two clear rotary querns, one thin and large (probably a lower stone) and the other thicker and smaller. Pottery includes a native sherd with a cordon decoration – similar to that found commonly in the Hebrides. Animal debris included a fragment of elk antler. Dimensions: according to the Commission's description  the external diameter is about 15.25m (50ft), the internal probably about 6.71m (22ft) when the thickness of the "scarcement" has been subtracted; the wall proportion would thus be about 44%. A new survey of the interior in 1971 showed that in plan the inside wallface was very close to a true circle with a radius of 3.32 +/- 0.06m (diam. 6.64 m); the outer face could not be traced at that time. Sources: 1. NMRS site no. ND 36 NE 2: 2. Anderson 1901, 144-5: 3. Proc Soc Antiq Scot 43 (1908-09), 16-17 (finds): 4. RCAHMS 1911b, 15-16, no. 35: 5. Young 1962, 183: 6. E W MacKie in Discovery and Excavation Scotland 1972, 16-17: 7. Caulfield 1978, 132, no. 27: 8. Swanson (ms) 1985, 553-57 and plan: 9. Heald and Jackson 2001. The promontory on which the broch N of Skirsa Head stands, is also defended on the W by a fortification that cuts across its neck. Excavations by Sir Francis Tress Barry in the 1890s, reported by Joseph Anderson (1901, 144-5), focused on the broch, which measures about 6.7m in diameter within a wall 4.3m in thickness; there was a checked entrance, a mural stair and what has been described as a scarcement, though the date and purpose of this feature is unclear (see discussion in MacKie 2007, 479-80). There were traces of external strucures, one of which seems to have overlain the broch, and immediately S of the entrance to the broch, which opens ESE, there is what seems to have been a chamber or well sunk some 3m deep. The outer fortification comprises a ditch about 9m in breadth set immediately in front of the broch on the landward side, and there is no record of a wall or rampart on either lip; it encloses an area measuring some 90m in length from E to W by 20m transversely (0.16ha) which has been heavily eroded along its N margin, where part of the broch wall has fallen over the cliff. Finds from the excavations include pottery, several bone tools and a comb, a piece of slag, a stone lamp and several discs, whorls and whetstones (Anderson 1901, 145; Proc Soc Antiq Scot 43 (1908-9), 16-17).